I saw a strange thing on my walk to minyan the other morning. 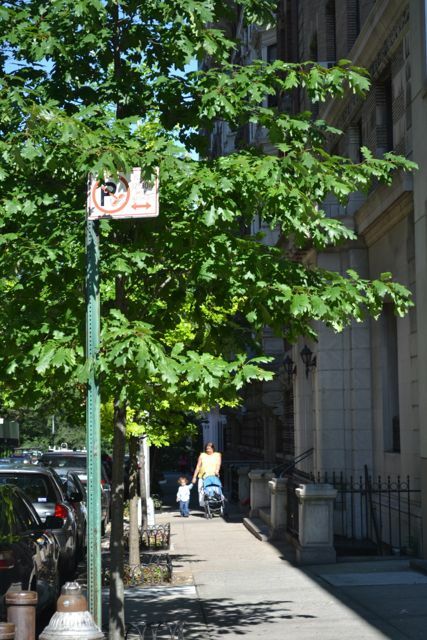 At a quiet side street with no cross-traffic in sight, a woman stood still, waiting for the walk sign. All around her people bustled by, peeking quickly to make sure no truck was barreling down the street before crossing, but she patiently waited for the light to indicate that it was her turn to walk. She wasn’t setting an example for a toddler, and she didn’t look like a tourist. This woman was content to obey a sign that others, myself included, blithely ignored. If you don’t live in New York City, perhaps you won’t find my story strange, but let me assure you, one doesn’t see this every day. Yet with pedestrian casualties a stubbornly persistent statistic in our city, perhaps more of us should heed her example. I am often alarmed by people staring intently into their phone screens as they cross busy Broadway. We could all stand to pay more attention to how and when we walk. This entry was posted in Divrei Torah on May 16, 2014 by Rabbi Danny Nevins. The confluence of Yom Ha’Atzmaut with Parashat Behar reminds us that the Torah is designed not for individual spiritual expression, but for collective fulfillment. Our short portion emphasizes communal responsibility. Its distinctive mitzvot of the sabbatical and jubilee years both require individuals to relinquish their private holdings, whether on real estate or over other people, so that all of Israel can live in freedom and dignity with God upon the land. 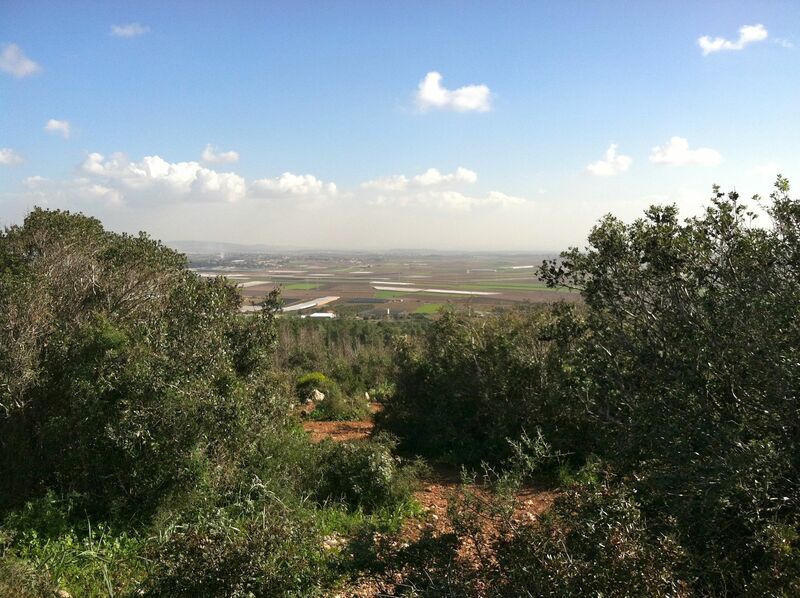 “Do not sell the land in perpetuity, for all the land belongs to Me (כִּי־לִי הָאָרֶץ), for you are strangers and residents with Me” (Lev 25:23). Themes of social solidarity between rich and poor pervade these verses, and the overall message is that God’s design for Israel is the creation of a fair society where everyone has a stake. This entry was posted in Divrei Torah on May 9, 2014 by Rabbi Danny Nevins. 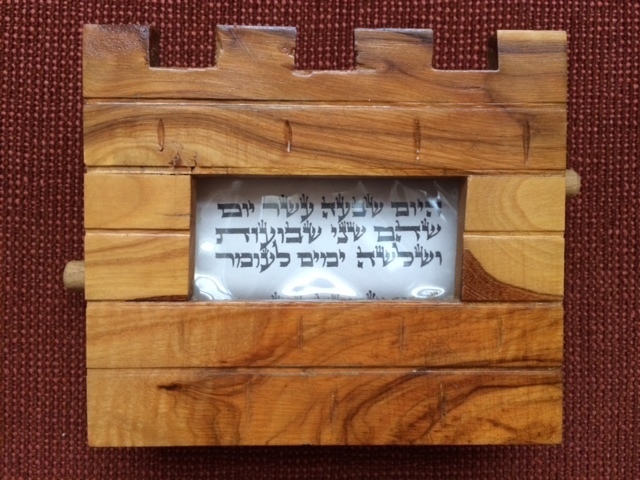 A favorite heirloom from my teacher and mother Phyllis Nevins z”l is an olive wood Omer counter that she bought in Israel. Each night we twist a little wood peg to advance the scroll to announce the new day in handsome STaM letters. Today is the seventeenth day of counting Omer, which is two weeks and three days in our passage from Passover to Shavuot. In Parashat Emor, the great list of festivals includes the commandment “to count for yourselves seven perfect weeks…you shall count fifty days.” (Lev. 23:15-16) In Deuteronomy (16:9) the commandment is repeated, “seven weeks you shall count for yourself.” Noting the dual emphasis on counting days and weeks, the Talmudic sage Abaye teaches that it is a mitzvah to count both by days and by weeks (b. Rosh HaShanah 5a; Hagigah 17b; Menahot 66a). This teaching is recorded as normative practice in the Mishneh Torah and Shulhan Arukh, and it is now standard practice wherever the Omer is counted. However, in addition to the normative counting by days and weeks, there is a mystical progression that is counted of the seven lower aspects or “sefirot” of Kabbalah, from Hesed to Malkhut. Each week is associated with a different aspect of the divine personality, and so too is each day, so that you get interesting combinations of qualities. The general motion is from top down, so that one imagines drawing divine energies from heaven into the world, until God’s unity is manifest on earth. Once each week there is a doubling of sefirot, as the weekly and daily sefirot come into alignment. Today, for example, is both the week and the day of “Tiferet,” the glorious balancing of compassion and judgment that functions as the centerpiece of the entire Sefirotic system. Tiferet is also known as the Holy Blessed One (הקב״ה) and the broader drama of the season of counting is to reunite the divine qualities of Tiferet and Malkhut, which is also the mystical project of each Shabbat. The climax of the Sefirotic count comes on the fiftieth day, or Shavuot, which the kabbalists teach us to view as the marriage of Tifereth and Malkhut. As the Zohar says, “After seven weeks elapse, the Holy King comes to couple with Assembly of Israel, and Torah is given. Then the King is adorned with complete union, and oneness prevails above and below.” (Zohar III: 96b; p.120 in volume 8 of Daniel Matt’s edition). This entry was posted in Divrei Torah on May 2, 2014 by Rabbi Danny Nevins.